Have you already got your qualification and want to know what you can do with it? Or are you just starting out and ready to be inspired by the opportunities available in this exciting, varied and fast-paced industry? Read on to find out more. What’s it like working in the hospitality and catering industry? 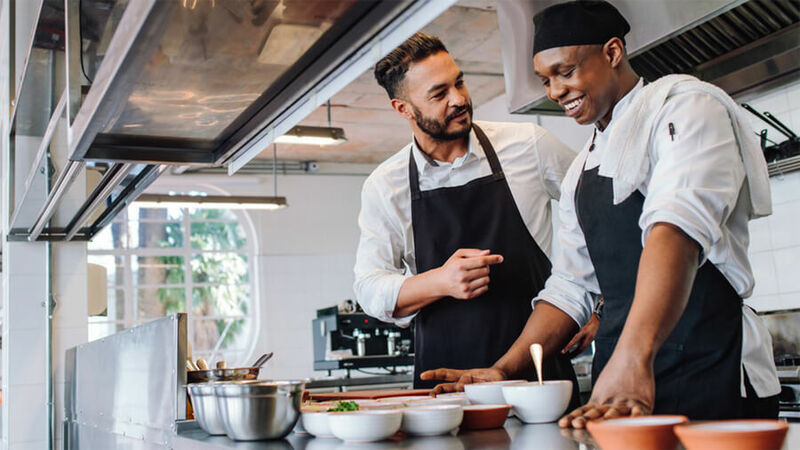 Working hours – the nature of the hospitality and catering industry means you are likely to be working irregular hours with busy shifts, especially over public holidays and weekends. However, it can be exciting and many people in the industry thrive in the fast-paced environment. Customer-focused – the hospitality and catering industry is all about creating a positive experience for your customers, whether they be diners in a restaurant, hotel guests, a couple planning their wedding or the after-work drinking crowd. Once you’ve chosen which area you want to specialise in, there are many routes you can take to your dream job, whether it is further education, in-house training, apprenticeships or simply working your way up through the industry. You can take your skills and work around the world. You could enjoy flexible working hours. Many jobs offer responsibility early on. It can be easy to move between jobs and niches within the industry. You get to make people happy.